She accepted her call to ministry and was commissioned and ordained an Elder in Full Connection by the North Georgia United Methodist Conference and appointed associate pastor at Cascade United Methodist Church for eight years. In June 2015 Rev. Lemons was appointed as Senior Pastor of Newnan Chapel United Methodist Church. She is a member of the North Georgia Board of Ordained Ministry. She served as one of the Service Coordinators for the 2015 North Georgia Annual Conference. She graduated with honors and received her Master of Divinity degree from Gammon Theological Seminary at The Interdenominational Theological Center. She received the Gammon Theological Seminary Highest female G.P.A. Award and served as the Student representative for the Gammon Seminary Board of trustees. She is a second career commissioned pastor with expertise in administration and healthcare. She has aBachelor of Science in Nursing from University of Louisiana, Lafayette, Louisiana; and dual masters from Emory University, Atlanta, Georgia one in Master of Public Health Administration and the other in Master of Nursing – Community health. 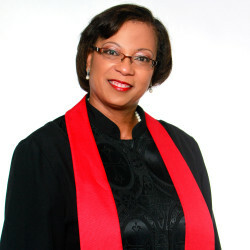 Pastor Lemons is a Board Certified Registered Nurse and a Board Certified Primary Care Family Nurse Practitioner.With more than twenty (20) years of nursing and administrative experience, she has provided healthcare services at Universities, where she developed the student Health Clinics and served students, staff, and faculty. Rev. Terri Lemon’s ultimate desire is to be in the perfect will of God by preaching, teaching, and sharing the Gospel of Jesus Christ. She has served in the pulpit ministry at Cascade as a member of the pastoral leadership team during the Sunday morning worship services. She provided pastoral leadership to the Nurture Division which includes the following areas: Prayer Ministry, Caregivers Ministry, Marriage Ministry, Christian Education, Sunday School, Discipleship (New members), Health & Wellness, Resurrection and Stewardship Ministry. Pastor Lemons has served as a speaker at several churches as well at the Ben Hill/Cascade UMC Marriage Retreat, preacher at churches in Baton Rouge, Louisiana, Dallas, Texas and Atlanta, Georgia. She has been cited among Outstanding Young Women of America. Pastor Lemons finds her joy in sharing the love of Christ. Pastor Lemons is the wife of Lovell Lemons, Director of the Office of Civic Engagement at Georgia State University. They are blessed to have one daughter-LaShuandia Lewis.